I walk my “dad” at least twice a day because, heaven knows, he needs the exercise. He likes burning a few calories and getting the chance to clear his mind. I’m not quite sure there’s much in there that requires clearing, and I’m concerned about wasting time draining an empty well, but he seems to benefit. There are times however, like this afternoon, when I have my doubts. We were walking as we always do, tethered together with my designer leash – the leash is obviously for his benefit because I heel better than Dr. Oz – when he suddenly yells, “We gotta go home..I forgot your leash.” So I gave him a good yank (yanking his chain has become commonplace for me) and at least temporarily brought him back to his senses. This is the same guy who was driving me home from the vet last week and, while stopped at an intersection, repeatedly pointed at the red light with his garage door transmitter, clicking it impatiently for a light change. When we made it home, he instructed me to “speak”..I guess he thought that would open the garage door. But you gotta love him. He just needs a little work. And that’s why I’m here. 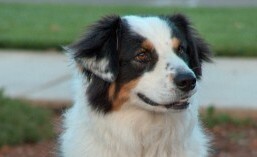 This entry was tagged aussie, australian shepherd, blog, dog, early morning walks, exercise, humor, physician, walks. Bookmark the permalink. ← What kind of ridiculous name is “Flapjack”?